This section provides an overview of what playframework is, and why a developer might want to use it. It should also mention any large subjects within playframework, and link out to the related topics. Since the Documentation for playframework is new, you may need to create initial versions of those related topics. Java 8 - download the relevant installation from Oracle site. sbt - download from www.scala-sbt.org. Create sub-directory conf under the activator root directory activator-dist-1.3.10. Create in the conf directory an empty file named sbtconfig.txt. Be sure to replace 2.4.x here by the exact version you want to use. Play 2.5 generates this line automatically. If you already have sbt installed I find it easier to create a minimal Play project without activator . Here's how. That's it! Your project is ready. You can launch it with sbt . From within sbt you have access to the same commands as with activator . 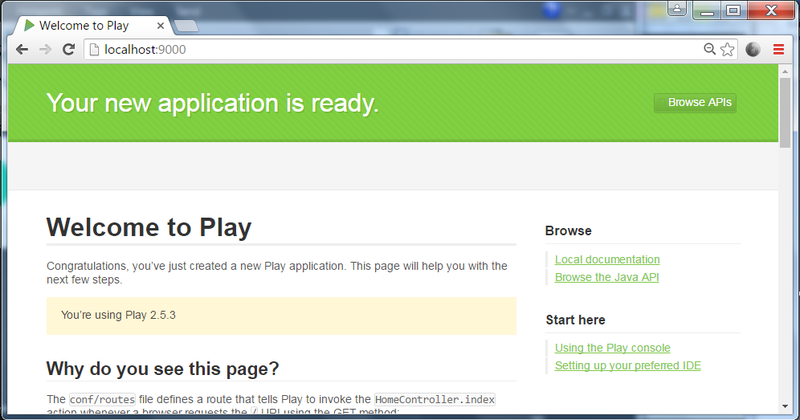 Play will use the default Java or the one available at the $JAVA_HOME path if defined. Download the latest Play binary package and extract it in /Applications .